OpenLearning supports multiple technologies to provide interoperability with other systems, tools, and apps. This article covers LTI or Learning Tools Interoperability. This article is a little more technical than most. Ask us (or your IT team) if you have any questions! LTI is a standard from IMS Global which prescribes a way to easily and securely connect learning applications and tools. This allows trust to be shared between two systems by means of a shared secret key stored on each system, per registration of an LTI integration. The ordinary operation of LTI is as a launch strategy, e.g. launching one cloud service from another, and sharing the logged-in user’s session between systems. OpenLearning is acting as the “LTI Tool Provider” when it allows an external enrolment/student management system or LMS to be able to complete an authenticated launch of OpenLearning, without requiring the user to complete any additional sign-in credentials. The external enrolment system is acting as the LTI Consumer. I.e. When a student who is logged into an LMS (e.g. Moodle), clicks to launch OpenLearning from within Moodle, will have their Moodle credentials recognised in OpenLearning. They don't need to create an OpenLearning account or sign in again. A course or institution admin can be issued with the credentials needed to provide the LTI Consumer. LTI credentials can be issued either per OpenLearning class (set up within the course itself), or for a whole institution (set up in Institution Settings). There isn't much of a difference between setting up credentials per class or for the whole institution. If you set them up per class, if you create another class in the future, you would need to set up the LTI credentials for that new class. If credentials are set up for the institution, you would only need to set them up once. 1] Setting up LTI for Blackboard works best with institution level credentials. 2] Setting up LTI for Moodle can be done either per class or at the institution level. When issued for a class, the LTI Consumer is given the ability to create a launch link for the end user to follow, which will automatically sign the user into OpenLearning and enrol in the associated class. When issued for a whole institution, the LTI Consumer can specify the class to target by using a “context ID” field (send through in the LTI launch parameters). This context ID will be mapped to an OpenLearning class within the OpenLearning platform. Many LMS systems automatically generate a context ID for a course delivery, and when performing a first-time LTI Basic Launch from an LTI Consumer as an OpenLearning administrator, you will be prompted to choose or create an OpenLearning class. The “context_id” LTI parameter refers to the current LTI Consumer’s course delivery context for a given launch link. Upon following the launch link and choosing an OpenLearning class, this class will be mapped to the “context_id” for that launch link. This means that on subsequent LTI launches via this launch link with the same “context_id”, users will be directed to (and enrolled in) the corresponding chosen OpenLearning class. The mappings between OpenLearning classes and LTI context_ids can be viewed and modified in the “Single Sign On Mapping” section in Institution Settings > Integrations. 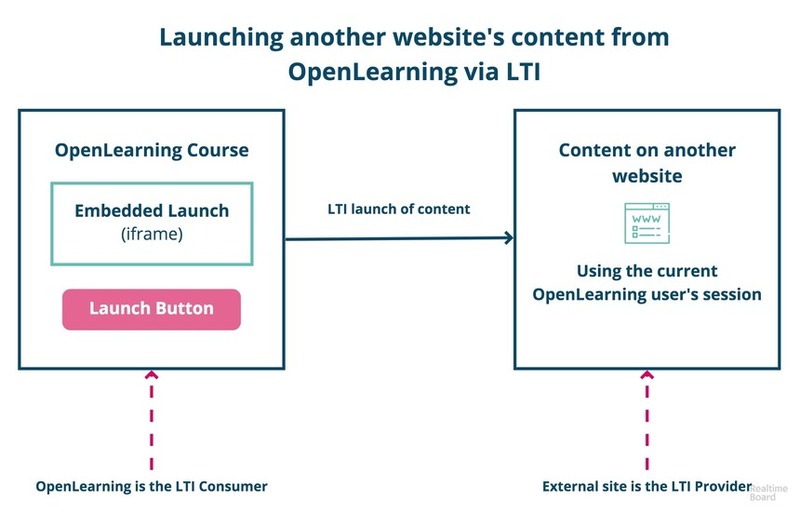 OpenLearning is acting as an LTI Consumer when it allows a user who is signed into OpenLearning to perform an authenticated launch of an external activity, tool, or widget embedded into or linked from an OpenLearning course experience, without requesting additional sign-in credentials. I.e. When a student who is signed into OpenLearning completes an authenticated launch of an external activity or tool that is embedded within the OpenLearning course as a widget. This enables additional online cloud services to be embedded into the OpenLearning course flow, or launched from within OpenLearning courses. When an LTI Tool Provider is launched from within OpenLearning, the launch authenticates the signed-in OpenLearning user with the tool (and sharing the internal OpenLearning user identifier) which can then be used by the tool to store account or session information for that user.